The temperature outside has plummeted, signalling the arrival of winter, and this 1922 poster by Kauffer really shows what it feels like to battle the elements when it’s cold and wet and windy! By 1922, Edward McKnight Kauffer was already an established poster designer for the Underground, and he was given great freedom in his designs. Kauffer was an expert in combining modern art movements with commercial design, bringing more radical or challenging styles to the streets of London. The Museum is fortunate to have the original artwork for this poster in its collection. The artwork gives an interesting insight into Kauffer’s method of working. The background is created in gouache (poster paint) whilst the tiny figures are cut out of paper and pasted onto the poster design. 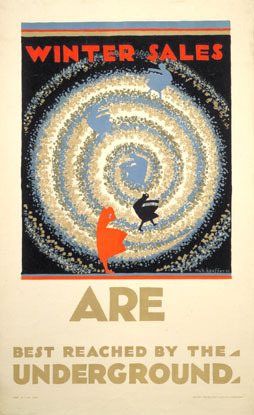 This poster follows on from Kauffer’s 1921 earlier Winter Sales poster, in which he chose to adopt similar colours and styles to express the same theme. You can read more about this poster in Brian Webb’s blog post.